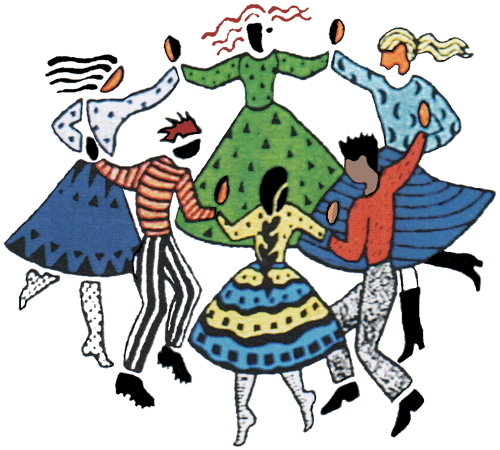 Information: Maine Folk Dance Camp: A folk dance camp. Maine Folk Dance Camp was founded in 1946 by Jane Farwell, who invited Mary Ann and Michael Herman as teachers and then encouraged them to find their own site and take over the camp in 1948. Mary Ann directed the camp until her death in 1992. Maine Camp lasted two more years, until 1994 when Michael decided to close the camp. 1975  Nelda Drury, Andor Czompo, Jane Farwell, Ralph Page, Ada Dziewanowska, Laura De Chavarria, Sunni Bloland, John Pappas, Morry & Nancy Gelman, Henry Lash. Information: Mainewoods Dance Camp: A folk dance camp. 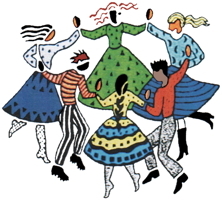 In 1995, devoted staff and campers of Maine Folk Dance Camp founded Mainewoods Dance Camp with the theme of "International Understanding Through Dance" and incorporated as a 501(c)3. Mainewoods Dance Camp is located at Camp Indian Acres along the Saco River in Fryeburg, Maine. The Main Building is where it all happens. It offers dining, dancing on a spacious hardwood floor, and a lounge for relaxing. The Saco River runs right along the camp grounds, a wonderful place to swim and cool off, or just sit along the bank and relax. The camp grounds also feature a swimming pool, volleyball, basketball, and tennis courts. Two issues of Mainewoods Memories are published each week and contain notes about happenings during the week. 2010  Loui Tucker, Tom Bozigian, Anne Smith, Yves Moreau, France Bourque-Moreau, Ahmet Lüleçi, Mihai David, Lee Otterholt, Richard Schmidt. 2011  Teme Kernerman, Jaap Leegwater, Heide Leegwater, Roo Lester, Dale Hyde, Cristian Florescu & Sonia Dion, Sani Rafati, Lee Otterholt, Anne Smith. 2012  Danny Pollack, Susan de Guardiola, Olga Sandolowich, Cristian Florescu & Sonia Dion, Tony Parkes, Yuliyan Yordanov. 2013  Danny Pollack, Lucia Cordeiro, Jaap Leegwater, Željko Jergan, Kay Munn, Sanna Logden. 2014  Erica Goldman, Yves Moreau, France Bourque-Moreauy, Cristian Florescu & Sonia Dion, Christos Papakostas, Kay Munn. 2015  Maurice Perez, Renée Park, Sari Soukas, Roberto Bagnoli, Richard Balazs, Steve Kotansky. 2016  Erica Goldman, Ercüment Kılıç, Jaap Leegwater, Cristian Florescu & Sonia Dion, Roo Lester & Harry Khamis, Miroslav Marčetić. 2017  Miriam Handler, Tom Bozigian, Steve Kotansky, Harry Khamis, Lee Otterholt, Vlasto Petkovski. 2018  Roberto Bagnoli, Steve Kotansky, Richard Schmidt, Wim Bekooy, Yves Moreau, France Bourque-Moreau. 2019  Caspar Bik, Penny Brichta, Cristian Florescu & Sonia Dion; Iliana Bozhanova, Miroslav Marčetić.